Hacienda Constancia belonged in the late 1800s to Pedro Roselló Irizarry (1856-1916) and his wife Matilde Roselló Cristy. Pedro and Matilde had no children, so upon his death, the property passed on to his nephew David Bravo Roselló (1895- 1979) the son of Luis Bravo Gonzalez and Cipriana Roselló Cristy. In 1921 David sold the then 410 cuerdas Hacienda Constancia to a firm comprised of his brother Luis Bravo Roselló (1888- ) and their brother-in-law Pedro Nieva Mangual (1884-1936) who was married to their sister Judith Bravo Roselló. At one pont in time between 1921 and 1923 Hiram Gómez acquired Hacienda Constancia but turned around and sold it in 1923 to Spanish immigrant from Sóller Pablo Casasnovas Vicéns (1878-1973) who in 1925 married Antonia Alemañy Oliver after the death if his first wife Juana Ripoll Bauzá (1886-1923). The family of both Juana Ripoll and Antonia Alemañy were of Spanish descent, land owners and coffee growers in the area at the time. Pablo Casasnovas Vicéns came to Puerto Rico in 1892 to work with relatives at the firm Canals, Coll & Cía. which was established in Lares and Las Marías. By 1913 he already owned Hacienda Porvenir in Barrio Chamorro of Las Marías which he had acquired with his brother José and the help of a $10,000 loan from also brother Jaime who had lived in Puerto Rico but had returned to Mallorca. When Pablo acquired Hacienda Constancia, his brother José kept Hacienda Porvenir. After the death of Pablo Casasnovas Vicéns in 1973, his heirs leased the hacienda with option to buy to Pablo Torres Soto who after executing the option to buy, sold it in 1980 to Allan Levin. Mr. Levin did not continue planting and processing coffee but in turn expanded the dam built to channel water to power the hydraulic turbine and created a fish hatchery. At one point in time Hacienda Constancia had a "trapiche" which already by the 1920s was in ruins. In 1936, 13 acres were given to the Puerto Rico Economic Reconstruction Administration who segregated them and distributed the parcels to local people. Today Hacienda Constancia is the property of Enrique Gómez. It is located off of PR-409 Km 1.1 in Barrio Cerrote. 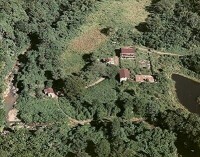 The aerial picture below made available with permission and the courtesy of Archeologist Dr. Luis Pumarada O'Neill. The other pictures are part of a 1987 study made by Dr. Pumarada O'Neill obtained at the Puerto Rico State Historic Preservation Office.